This quilt, painstakingly hand stitched by Raymer, is often featured as one of the "suns" between story segments on CBS Sunday Morning. Photo Harland Schuster for KSF. Interior of the Raymer Studio. Photo by Harland Schuster for KSF. The Red Barn Studio Museum is a finalist for the 8 Wonders of Kansas Art because it was the working studio of professional and profound artist/craftsman Lester Raymer and is filled with his diverse art and craftwork, most of which are made from recycled materials. Red Barn Studio was the working studio of professional artist and craftsman Lester Raymer (1907-1991). The Red Barn Studio is filled with Raymer's art and handiwork, from paintings and prints to ceramics and metalwork, from woodcarving to stitchery, furniture and jewelry. His work is influenced by his love for the world's great painters, especially the Spanish masters, the Southwest and Mexico, religious symbolism and folk art. He had a fascination with the circus (developed as a boy in Oklahoma), which is a thematic element in many of his works. R aymer considered painting and printmaking his most important work, which he studied at the Chicago Art Institute, but he worked in almost every medium. Each year he created a special Christmas gift for his wife, Ramona. These gifts included painted boxes, candlesticks, and other decorative items. In 1960 Lester began the tradition of making toys every Christmas for Ramona. He made 53 toys over a period of 30 years. Examples of these gifts and toys are on display at the Red Barn Studio. 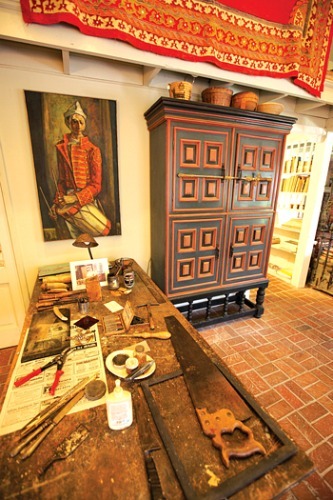 Much of Lester Raymer's art and craft work, including the Red Barn Studio, was made from recycled materials. Raymer took ordinary things, generally discarded mundane objects, and transformed them into beautiful works of art and crafts, gifts, toys and decorative elements for the studio. The Red Barn Studio was restored and opened as a museum to the public in September of 1997. Raymer was a studio artist in Lindsborg, Kansas until his death in 1991. Hours: Tuesday-Sunday 1- 4 p.m. Admission fee: Free, donations welcomed.